The Trireme (Greek trieres) was the "state of the art" fighting ship designed to be able to cover long distances quickly under oar and sail, and in battle to ram enemy ships with devastating effect. Money from the new vein of silver in Laurion enabled Athens to buy timber from Italy to increase her fleet from 40 in 489 BC to 200 in 480. The polis paid for the ship and its crew: equipment and repairs were paid for by a rich citizen as one of the liturgies (trierarchia - a brilliant Athenian notion which shamed the richest citizens into spending their wealth on the city, without the need for taxation). A full-scale replica of a trireme was launched in 1987, painstakingly reconstructed, using all available ancient evidence (especially the Lenormant relief - below). Full information about Olympias, the Greek navy's least up-to-date- ship can be found on the official trireme project web site. Why were all Athenian triremes given girls' names? 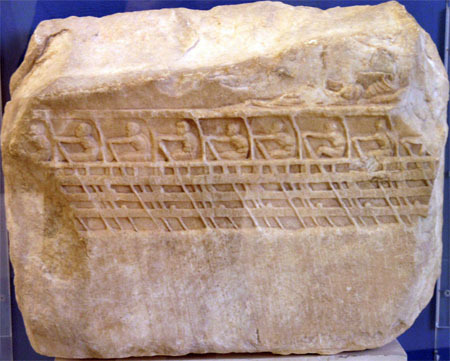 I've recently discovered that the names of several hundred fighting ships are preserved on an inscription in Athens. A fascinating list! The three harbours at Peiraieus are the best in Greece and possibly the Mediterranean; one was used entirely for triremes. 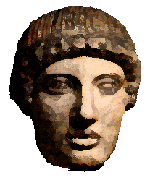 After the victory at Salamis in 480 BC, Athens undertook the leadership of an alliance of Greek states to keep the Persians out of the Aegean - the Delian League, which gradually became the Athenian Empire. Athens was able to import the preferred wheat from the Ukraine - they didn‘t like the barley which could have made them self- sufficient; piracy could be suppressed. The fleet spent 8 months at sea, with 90 ships on duty at any one time (200 for Egypt) Pay was 1 drachma a day (increased in 415 BC). Crew was 170 oarsmen + 30 "non-sailors" (10 marines, sail-crew, carpenter, helmsman, piper) + captain. Oarsmen sat in 3 tiers [Aristophanes mentions the olfactory disadvan tages of being on bottom tier during a long voyage] Training was necessary: Athens undertook many small military expeditions just to keep the oarsmen fit, although as far as skill was concerned "the majority can row as soon as they get aboard since they have practised all through their life" (The "Old Oligarch"). No ancient ship-building manuals nor sailing directions have survived. So before 1971, when the earliest identifiable warship (3rdC BC Carthaginian) was found off NW Sicily, details of design and manning (particularly the placement of rowers in a trireme) were guesswork, based largely on surviving representations of ships on stone reliefs, vase-paintings,etc. Both fighting ships and cargo vessels had oars + sails for propulsion. The trireme had a large square sail. When not stripped for battle, she cruised with a full spread of canvas, but when preparing for action she left all her gear, including the sail, ashore. For obvious economic reasons, oared cargo vessels were rare, since crews of rowers occupy space at the expense of cargo. Before the invention of gunpowder, and long after, the offensive capabilities of war-ships were limited to setting an enemy vessel on fire, or piercing the hull below the water-line, or boarding. Advances in Greek warship design were aimed at achieving the speed necessary for successful ramming without loss of stability. Impact theory indicates that unless the attacker reached the critical speed of about 10 knots at the moment of impact, it would crumple, while the target vessel escaped almost unscathed! Before the invention of the trireme the standard warship was a single-banked ship with a crew of 50 rowers (25 a side), called a pentekonter. To increase momentum meant more rowers, to reduce extra size and weight meant putting oars + oarsmen over one another. This raises the centre of gravity and threatens the stability of a very low-draughted ship. The ingenious solution has only recently been explained and proved. They could, it seems, move fast under sail, reaching a maximum of perhaps 14 knots under the most favourable weather conditions. But when dressed for battle the trireme was nothing else but a stripped-down water-borne projectile, propelled by human muscle power.